Wind Mitigation… Inspection. What? – "Making a House, your Home"
The age, design and characteristics of the roof of your house, or the soon to be your house, can save you money as Insurance companies offer premium discounts based on the property´s level of wind resistance. Sihle Insurance Group, one of the largest privately held agencies in Florida, consistently ranking in the “Top 100” countrywide, came up with this article that explains Wind Mitigation Inspection at its best. “Florida is well known for all of the damage caused during our stormy seasons. The power of wind can burst open windows, doors, split open walls, creating and increasing uplift forces on the roof. Once the wind breaks open any part of the home, wind and water will enter and damage to the interior escalates dramatically. Homeowner’s insurance companies offer premium discounts based on a home’s level of wind resistance. 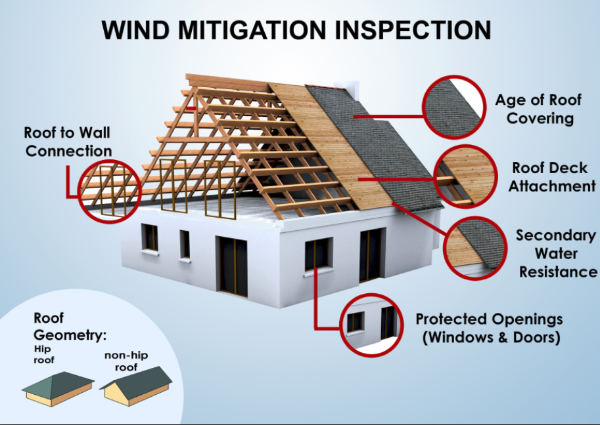 These wind mitigation inspections are used to determine whether specific protective reinforcements are in place, therefore decreasing the amount of damage your home may receive during a hurricane or strong storm. A home with these features is less likely to incur costly repairs during a “high wind event” which saves the insurance company money. What is Wind Loss Mitigation? Mitigation is the act of making a condition less severe. Therefore wind loss mitigation is the act of minimizing loss that might be caused by wind damage to your home. After the devastating 2004 Hurricane season many Florida based insurance companies were forced to increase premiums due the substantial losses they occurred. The Florida Legislature saw the rising premiums as a problem for Floridians so they agreed that if homeowners made steps to make their homes more secure from wind loss, they should be rewarded by a reduction in insurance premium. So How Do I Get the Credits? In order to get credits you must have a Wind Mitigation report completed by a licensed inspector. Many people believe that their Homeowners carrier is responsible for paying for the report, but that is not the case. That being said, the mitigation report usually pays for itself within the first year, with prices ranging from $70 – $125. These prices are typically reduced if you purchase another report from the inspector, such as a 4-point inspection. Make Sure You Request the 2012 Form! Most carriers are now requiring that the Wind Mitigation Report to be on the 2012 form. If you have an older form, you will most likely have to get a new mitigation completed to apply for credits. Roof Age: If your roof was replaced on or after March of 2002, it most likely is eligible for the Florida Building Code of 2001 credit. This code required contractors to use improved construction techniques, thus making roofs sounder. Roof Covering: Common types include shingles, clay tiles, metal, and built-up-tar and gravel. The key factor in roof covering performance is the method of attachment of the roof covering to the roof deck. This feature must meet or be equivalent to the Florida Building Code which has specific material and attachment specifications which are superior to building practices in the past. Roof Deck Material & Attachments: The method used to connect the roof decking (plywood, metal panels, etc.) to the roof trusses or rafters. The performance of the roof deck is of critical importance in keeping hurricane losses to a minimum. This is usually achieved by nail fasteners. Nail size, type, spacing, and penetration depth into the truss or rafters determines the uplift resistance of the deck. The difference in uplift capacity of 8d (2 ½”) nails at a typical nail spacing and 6d (2 ½”) nails at the same spacing is a factor of about two times stronger. Roof-to-Wall: This is another critical connection that keeps the roof on the building and acts to transfer the uplift loads into the vertical walls. This connection is KEY to the performance of the building due to the large negative pressures acting on the roof. Secondary Water Resistance: Material applied to the roof covering to prevent water from intruding into the structure when the roof covering fails. Roof coverings often begin to peel off in peak wind gusts ranging from 70 to 100 mph. Roof Shape: Roof shape refers to the geometry of the roof. There are many common roof shapes in residential construction, including gable, hip, and flat (and many possible combinations). Some roof slopes and configurations perform better than others. Moderate roof slopes don’t tend to uplift the roof and push the building sideways and hip roofs provides greater stability during high winds regardless of which direction the wind blows. *A HIP shaped roof receives the largest insurance discount. This may help a protective home buyer consider which home to buy.